We had a riot in Singapore the other night. No, really, a riot. In Singapore! On Sunday night in Little India about 9:00 PM, a bus that transports construction workers ran over a Bangladeshi man. The reason why is still vague, but alcohol seems to be involved. As they plotted how to extricate the guy from under the bus (he died), a crowd of 100 that looked on soon swelled to 400. At some point it all went bad as the crowd attacked the bus and the driver. Police arrived minutes later and 7 police cars and an ambulance went up in flames with four more cop cars overturned before the riot police arrived. The police helicopter video looks like a scene from Iraq as the oxygen tanks in the ambulance exploded. So far, there is one dead, 18 sent to hospital and 27 arrested with likely more to come once they screen the CCTV videos. This is the first incidence of civil disobedience on this level since the race riots of 1964. Then, Malays and Chinese battled in the streets leaving 36 dead, 600 injured and over 3,000 arrested. 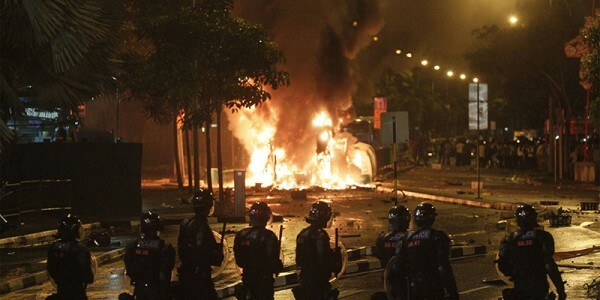 This riot, and the animosity between the local Chinese and Malaysians were a prime motivator to Singapore being kicked out of their union with Malaysia in 1965. This is different. There are one million low income foreign workers out of a population of five million. They are largely from impoverished Asian countries and the men (from Bangladesh and India) do construction, garbage collection and roadwork. Work that Singaporeans would never stoop to do. The women are largely from the Philippines and are maids and helpers. They have few basic rights, no unions, limited medical benefits that are often denied and little hope. The men pay agents upwards of $7,000 to get here often to find their wages cut or work days restricted. When they do work it is a 12 hour day, with at least a few hours more of travel time, 7 days a week. They live in compounds that are hidden from view on the outskirts of the island that I for one have never seen in 5 years here. They are ferried back and forth in open pick up trucks with no seat belts and usually no seats at all. According to the one enlightened interview I saw, Singapore has purposely developed an under class. A transient group of Indians and Bangladeshis that live at the margins of this society. Over 300,000 of them work construction with little or no protection under the law. They are often abused by their masters, denied medical care when injured and threatened constantly to be sent home if they complain. The only place these men can gather together in their few down hours is Little India. They are dark skinned wearing the clothes they work in. That would be out of place among the glam of Orchard Road. Singapore's response has been shock. The government is outraged that this could happen and the full weight of the law will be applied to those who participated. They warn the populace not to be 'xenophobic ' as web sites are filling up with vicious comments about 'foreigners' disrupting this happy and prosperous island. For now, alcohol has been banned until further notice in the affected area and heavily armed patrols will keep a sharp eye. But, nothing will happen. The fear of being sent home penniless will trump the righteous indignation of these poor people whose lives and labor have been so terribly taken advantage of.